The most remarkable thing about Corner Bed is that it saves a lot of space in your house. They are absolutely safe and comfortable and gives a secure place for your pet dogs to snooze. 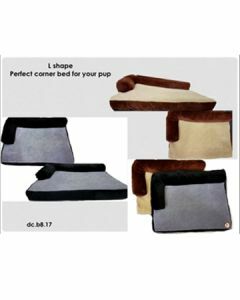 Discover the best Corner Beds formulated out of high-quality materials at PetsWorld for puppies, adult dogs as well as senior dogs. Corner Beds can use a normally unused space which helps for the better accommodation of the beds. Large breed dogs thus can be adjusted into a corner which will also make them secure. Various beds of different sizes are available at PetsWorld for making it adaptable for small, medium and large breed dogs. The type of beds works best for aged dogs as it will keep the stress off from bones and joints of the canine. Having a non-skid base in the beds helps to keep itself firm on any kinds of surface. You can select your favourite bed as we give you a wide range of options to choose from. Check out the most fitting Corner Beds for your dogs to give them a wonderful resting place.